The Here & There collective seem pretty well unstoppable, but with tireless energy and an apparently inexhaustible flow of good ideas, why would anyone want them to? Fresh from turning everyone’s favourite local coffee hole (Lonsdale Street Roasters) into a cracked Winter wonderland for Cold Sweats, Here & There’s next tour of duty is Crush, which opened at the ANU School of Art on Tuesday. The show’s title is also its call to arms, the theme rallying the who’s who and who knew of the Canberra art scene – such is the way the collective self curates. Following this approach, Crush is an assembly of responses that range from the decidedly tongue-in-cheek to the soberingly serious – from dalliances with daytime television to requisite accounts of heartbreak and emotional turmoil. With nearly forty artists in total, there really is something for everyone to fall for. What did it for me? It was hard to resist Kalina Pilat’s Fancy Man Pillows, applique cushions starring none other than a soft-eyed Mr. Darcy, and equally brilliant was Claire Pendrigh’s gold-leaf cassette – no doubt a homage to the mighty mix tape. Transcending the kitsch was Entwined by Elena Papanikolakis, charming at first but on reflection more deeply engaging and perhaps even worrisome. The dangling sheaf of friendship bracelets, braided and beaded, creates a planative knot, their simple, symbolic appeal made helpless and void of meaning. 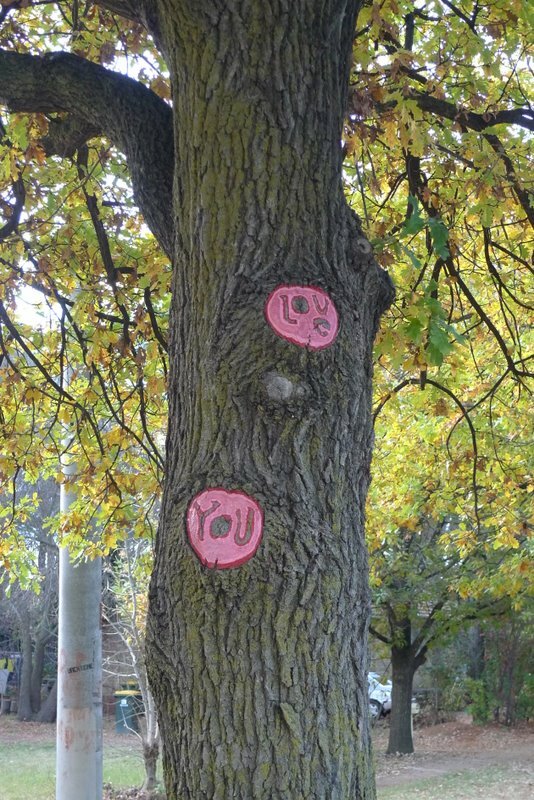 Resounding most forcefully was Jonathan Webster’s series I Love You Carvings – fleeting notes of adoration made direct into the bark of trees, captured on camera, the photographic prints then worked into with paint, and of course, glitter. Strangely enough, these works that I’m attracted to the most I find the hardest to explain why. Such is the nature of love I guess. Crush is on show until Saturday July 30th at the School of Art Gallery.